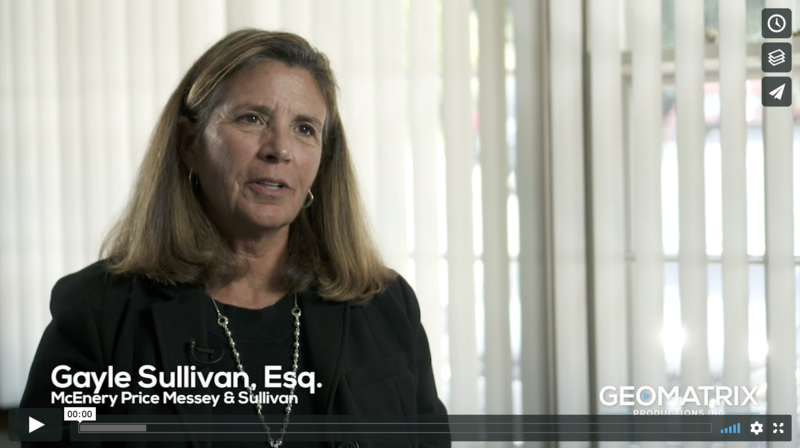 Gayle Sullivan and Charles Price of McEnery Price Messey & Sullivan talked with us about a case they settled for $13.5 million. They shared insights into the use of a legal settlement video and the decision to bring a loss of parental consortium claim in the case. Gayle Sullivan, Esq: Our client Allison Vandermaelen got into a terrible accident. She was on a motorcycle with her fiance. They were hit by a garbage truck and unfortunately he was killed and she suffered very serious injuries. Charles Price, Esq: What you want to do is capture on video, the experiences of the plaintiff. Especially their emotional and physical reaction to the injury, their recovery, their physical therapy. We had Geomatrix take early video of Allison when she was really in very rough shape. Charles Price, Esq: The CT Supreme Court has recognized that there is a value to a loss of a parental relationship by a child. Gayle Sullivan, Esq: Allison’s daughter Jenna was 16 at the time of this accident and that’s a critical time for a young girl, a junior in high school. She was deprived not only of her mother’s guidance, but she also had to become her mother’s caregiver. So this was kind of a perfect case for the loss of consortium claim. Gayle Sullivan, Esq: It was very powerful to show how Jenna at 16 had to provide a lot of physical care and emotional support to her mother, when usually it would expect to be the other way around. Gayle Sullivan, Esq: What we were able to capture was Jenna talking about how she felt losing her mother’s guidance, and the impact on her of having to provide physical care and emotional support to her mother, and that was very effective. We wanted to show the insurance company the strengths of our clients, the types of witnesses they were going to be faced with, and we wanted to do that early on in a way that a deposition transcript simply can’t do. Oftentimes clients can’t really express themselves directly to insurance people and lawyers in a way that they can do in the comfort of their own home. So we find that using the video in this manner is a way to present to people who are important in resolving the case, what kind of a witness the person is, and how they’re able to convey their story very effectively. Gayle Sullivan, Esq: The total settlement was about $13.5 million, and $1.5 million of that was attributable to Jenna’s loss of parental consortium. We felt that that was a very significant recovery for her because it was only for an 18-month period of her life. Yet it was a very significant part of her life and a significant loss to her. We felt that having the video depicting Jenna talking about the losses that she had and taking care of her mother played a big role in helping us to resolve that part of the case successfully. This video helped beat the odds. In the unfortunate event of a vehicular accident where a pedestrian is killed, it’s unlikely to consider the potential for the deceased to be at any fault. Sadly, in the case of Wagmeister vs. Simmonds, this circumstance did occur. With a difficult case to both illustrate and prove, John Cirello, Esq. turned to Geomatrix Productions to aid him with this task. Geomatrix Productions’ animator Tom Coben worked to create an accurate visual representation of what transpired the morning of June 28, 2013. Cirello and Coben were able to prove it was a series of bad decisions on the part of both the driver of the disabled truck, and Mr. Wagmeister himself that ultimately led to his death. The video illustrates that had the correct precautions been taken, this sad course of events could have been avoided. Cirello’s use of the visual medium allowed for his total defense to be heard without disruption. Cirello, usually arguing for the plaintiff, found himself on the opposite side of the bench in this case. Regardless, he was adamant that the use of video is both economic and essential in proving a point. “If you are dealing with a case worth over half a million dollars, you would be a fool not to make a video. When you are talking about those types of numbers, it will cost 1% of the overall settlement to produce a video. It makes no difference whether you are arguing for the side of the plaintiff or the defendant, and nothing tells a story better,” said Cirello. 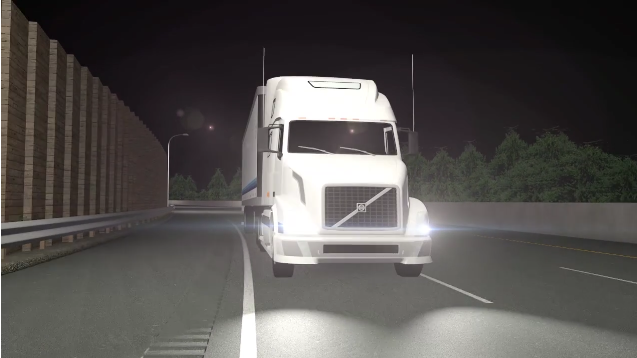 The case of Wagmeister vs. Simmonds shows how video production can be used to accurately recreate events and communicate a comprehensive argument. The economic value complemented by the unique ability to capture and maintain one’s attention, represent the key benefits video production has to offer in a court of law.